There’s a two-story brick building with a bright red door near Larkinville, just down the road from Flying Bison Brewing Company. Like most structures in the awakening former industrial district, its century-old neighbors have long been reduced to rubble-filled lots, and its own walls have enclosed countless establishments including a saloon and a shoe store, then for decades, nothing at all. By June of 2016 the entire storefront wall was missing, and Larkin Development was in search of someone who would turn the building into a live-work project instead of tearing it down. A local husband-and-wife pair of entrepreneurs, filmmaker John Paget and personal trainer Robin Paget, turned out to be a perfect fit for what was then essentially a blank slate. They bought the building, put on a new roof, stabilized the walls, and got to work carving out purpose-built spaces for both work and relaxation. Their studios, Paget Films and Larkin Training Room, occupy the first floor, while the couple and two black cats occupy the second — a living arrangement that was commonplace when the building was born and shopkeepers lived above their places of business. Wrafter says open shelves, like this reclaimed wood one, are a nice break from closed spaces — but only make sense if they’re as well-curated as Robin’s is (every night before she goes to bed). The apartment’s 970-square-foot floor plan was developed by architect Michael Anderson of Abstract Architecture, designer Aaron Mach did the kitchen layout, and Mike Metros of Metros Builders acted as general contractor. They initially brought in Sean Wrafter, owner of Wrafterbuilt and co-owner of the new Acme Cabinet Company, to collaborate on a few pieces of furniture for the space. But after tossing ideas around with the rest of the project team, Wrafter wound up deeply involved in crafting the kitchen. The striking space acts as the centerpiece of the living quarters, serving as a hub of utility and conversation sandwiched between an open living room flowing from the kitchen toward the front of the building, and a hallway adjoining one bedroom and bath towards the back of the apartment. In the middle of the kitchen is a commanding center island topped with a quartzite counter that provides ample workspace, a deep sink and barstool seating. Underneath and around it, strategic storage nooks and cabinets line the back wall from floor to ceiling, even bridging the doorway to the back hall. A stairway enclosed by thin cables – sturdy enough to act as a banister wall between the living room and stairwell but fine enough to appear completely open – deposits visitors upstairs. The Wrafterbuilt end cabinet is crafted of reclaimed wood. The culinary space’s color palate is a neutral blend of gray, white, stainless steel and natural wood, keeping the look calm and making it easy to match furnishings in the living room, which occupies the second half of the open space. The exception in the dead center of the quiet colorscape is a vibrant orange, retro-inspired Big Chill refrigerator. 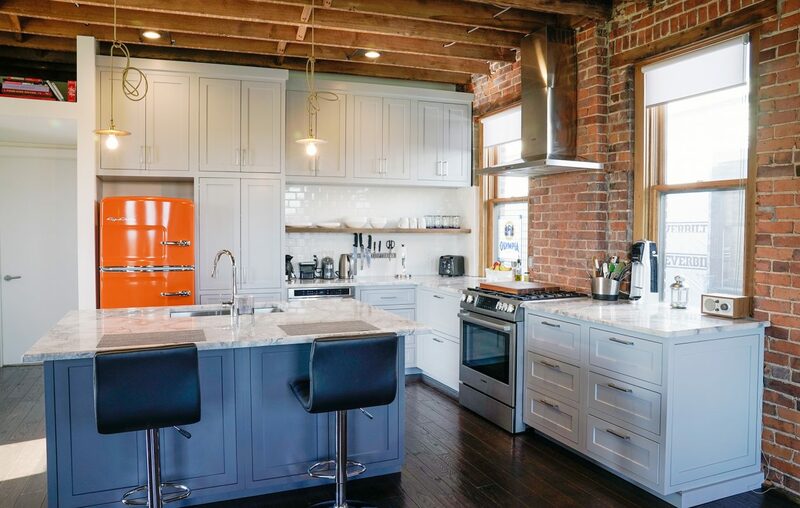 It’s a pop of color that highlights the warmth of the exposed brick walls, and its bold paint job and chrome accents remind old-car aficionado John Paget of a vintage automobile. The bedroom, bathed with natural light from South-facing windows, includes Wrafterbuilt wall-mounted headboard flanked by brass Emerson James light fixtures. That juxtaposition of modern and vintage elements seamlessly creates a timeless look around the kitchen. A rough-hewn, reclaimed-wood floating shelf hovers below clean-lined modern cabinets, with a backsplash of white subway tile that spans periods. The mid-century inspired refrigerator provides contrast to a stainless professional range. In some ways, this old-meets-new aspect of the Paget’s kitchen reflects the neighborhood around it. Theirs is one of the first new residential projects on Seneca Street in over 60 years, and developers have more planned. New breweries and distilleries on the block harken back to when local watering holes dotted every corner. A bowling alley is destined for an old building that used to be a bowling alley. And like the Paget flat, there’s comfort and promise in these new spaces that embrace the past and future all at once.